Methylene chloride is a popular solvent used in many industrial applications, including as an adhesive, aerosol propellant, metal cleaner and degreaser, chemical processor for polycarbonate resins and photographic film, and as a feedstock in the production of the refrigerant hydrofluorocarbon-32. Only about 10 percent of methylene chloride manufactured in or imported into the United States is used to strip paint. However, according to the Halogenated Solvents Industry Alliance, there is no alternative to methylene chloride that is as effective for paint stripping. The problem is that fumes from methylene chloride are extremely toxic; for example, acute inhalation can cause fatal depression of the central nervous system. In its proposal, the EPA said that data from the Occupational Safety and Health Administration (OSHA) and the Consumer Product Safety Commission indicated that between 1976 and 2016, 49 people had died because of exposure to methylene chloride during consumer or commercial use. This may underestimate the actual number of deaths, the EPA added. 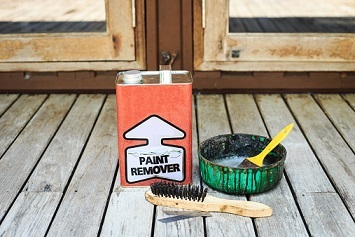 The new final rule does not dispute the need to ban consumer use of methylene chloride as a paint stripper, which is by far the most common use of the substance by the general public. Specifically, the rule prohibits the manufacture (including import), processing, and distribution in commerce of methylene chloride for consumer paint and coating removal (including distribution to and by retailers). The rule also requires manufacturers (including importers), processors, and distributors (but not retailers) of methylene chloride for any use to provide downstream notification of the prohibitions throughout the supply chain. The notification must be made on safety data sheets. “Limited recordkeeping” is also required. Methylene chloride is subject to regulation by other federal agencies. For example, in 1997, OSHA established a workplace permissible exposure limit (PEL) of 25 parts per million (ppm) as an 8-hour time-weighted average. But in its 2017 proposal, the EPA found this limit to be insufficiently protective. “The OSHA PEL is considerably higher than the levels at which EPA identified risks of concern for methylene chloride in paint and coating removal and would not be protective for the unreasonable risks identified,” the Agency stated. Accordingly, the EPA proposed to prohibit the use of methylene chloride for commercial paint and coating removal in specified sectors that included painting and decorating, floor refinishing, automotive refinishing, civilian aircraft refinishing, graffiti removal, renovations and contracting, bridge repair and repainting, and marine craft refinishing and repair. The Agency did not propose to regulate the use of methylene chloride in commercial furniture refinishing, also referred to as furniture stripping or refinishing, conducted by professionals or commercial workers. An exemption was also proposed for the use of methylene chloride for coating removal that is critical for national security. In its ANPR, the EPA notes that a ban on commercial use of methylene chloride for paint and coating removal is not the only option for meeting the TSCA requirement to eliminate “unreasonable risks” from exposure to a chemical. “Workplaces that have robust environment, safety and health protection programs and are in compliance with OSHA’s methylene chloride standard (which contains requirements for the use of engineering controls, personal protective equipment, training, and other requirements to protect employees from methylene chloride exposure) are likely to address any risks EPA could potentially find to be present from exposure to methylene chloride during commercial paint and coating removal so that they are no longer unreasonable,” the Agency now states. Accordingly, the ANPR contemplates a relaxed TSCA requirement that allows access to paint and coating removal products containing methylene chloride only to commercial users who are certified as properly trained to engage in use practices that ensure that the chemical use does not present unreasonable risks. The EPA also acknowledges that other more restrictive regulatory approaches may be appropriate for some conditions of use of methylene chloride for which the Agency determines unreasonable risk is present. Those additional conditions of use are not addressed in the ANPR.